Rob Colquhoun is one of prefabAUS’s founding directors and Director of two prefabrication companies which operate Australia wide: Prebuilt which provides design-led prefab homes, and Prebuilt Commercial which focuses on commercial solutions to corporate clients. An engineer by training, Rob has extensive experience in development management, manufacturing and corporate governance, in addition to his passion for quality building prefabrication. Australian housing is evolving. Attitudes to construction methodologies and material selections are changing. Many sustainability experts believe traditional construction is not a viable, long-term solution. Buildings worldwide account for 40 per cent of global energy consumption with the World Business Council for Sustainable Development’s projections suggesting total energy consumption will increase three-fold if no new policies are adopted. Traditional building methods prescribe large numbers of sub-teams and individual contractors operating onsite. This approach does not promote efficiency in terms of process, nor does it allow us to streamline our approach in response to lessons learnt across the industry. Prefabrication on the other hand has the potential to centralise repeatable processes that accumulate knowledge and allows us to improve efficiency and quality. Thus it can be said that achieving efficiency, retaining knowledge, and ensuring the on-going success of the house construction industry is not possible using traditional, onsite construction methods. Over the last decade Australia has been at the forefront of exploring alternative construction methods. Developing new technologies and approaches to off-site construction we have introduced highly energy efficient material and building practices that reduce ongoing energy consumption to the market. Whilst prefabrication and off-site construction approaches have been de rigor for the mining accommodation market, broad market acceptance in the mass housing market has been relatively slow. 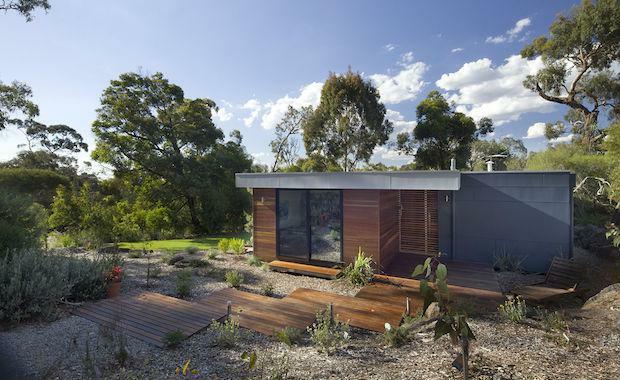 To date, prefab housing has been popularised amongst a sophisticated, early adopter market that is seeking creative design led solutions to difficult sites or time-constrained programs. The prebuilt method offers time, cost and quality benefits that far exceed those presented by the conventional site built approach. For example in Sydney’s bayside suburb of Clovelly, a $3 million home was factory built by Melbourne based prefab company Prebuilt. Installed on site within 12 weeks, the client was able to move in within six months of project commencement. This is comparative to an on-site build, which would have required an additional 10 -12 months of site time to deliver the same project, impacting the financing, risk and quality control of the final product. Meanwhile, on a larger scale, Unitised Building has successfully delivered several hundred high rise apartment units in various locations around Australia. From large independent family homes through to medium density low-rise apartments and high-rise apartments, we can see the full spectrum Australia’s housing typologies fulfilled with the factory built approach. Factory based prebuilt buildings incorporate new manufacturing techniques and pre-constructed wall and roof panel components that improve building insulation and efficiency. Encouraged by the close relationship between Architect and Builder, these factory based manufacturing methods are translating into intelligent designs that are being sought after both locally and internationally. However, there is still a long way to go for Australian prefab manufacturers to achieve serious market penetration and much of this will result from the development of better relationships between designers, manufacturers and material suppliers. At the moment there are insufficient existing purchasers to provide a robust customer stream of new clients for the high capital cost of mechanised plant set up to be immediately viable in Australia. Additionally, while the traditional, onsite building process allows for the ability to start and stop building at short notice, a wholesale move to prefabrication requires an on-going supply of business to encourage economies of scale, which may not be guaranteed in the housing industry. The restricted supply of new customers means it will take some time for the energy efficient and highly designed approaches of prefabrication to become the first choice for home buyers, over that of the current mass produced volume row housing built by Australia’s largest high volume low cost home builders. There is great potential for Australian manufactures and suppliers to develop componentry and relationships that deliver a hybrid approach of customised design and repeatable manufacturing techniques. Already we are seeing Australian manufactures produce lightweight, energy efficient materials that are now becoming an acceptable aesthetic for mainstream home construction. Thus I see the future of housing in Australia containing a much-increased percentage of prefabricated components and prebuilt modules. Whilst the methods we use to construct these houses will be driven by the collaborative efforts of designers, manufacturers and suppliers who endeavour to address the inefficiency and unsustainability of our current consumption practices and the associated energy and maintenance costs.